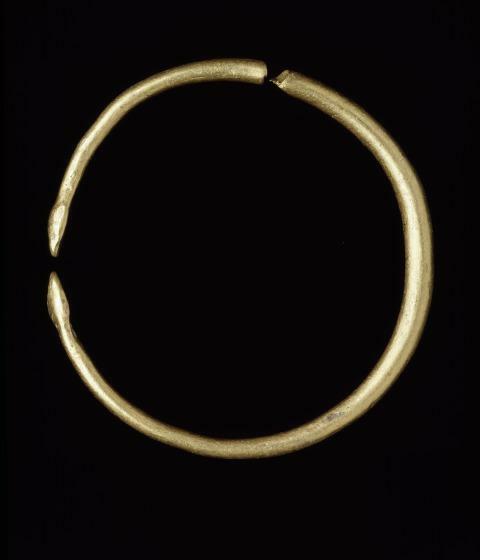 Buried with ingots of gold (1991.75.92.5, 1991.75.92.6), this unfinished bracelet was part of a goldsmith's cache discovered in Rome. The burial dates to the 1st century B.C.E., and nicely illustrates the transition from Hellenistic to Roman jewelry. The group is impressive for its total weight of nearly 746 grams, and it also allows a rare glimpse into the work of a Roman goldsmith. 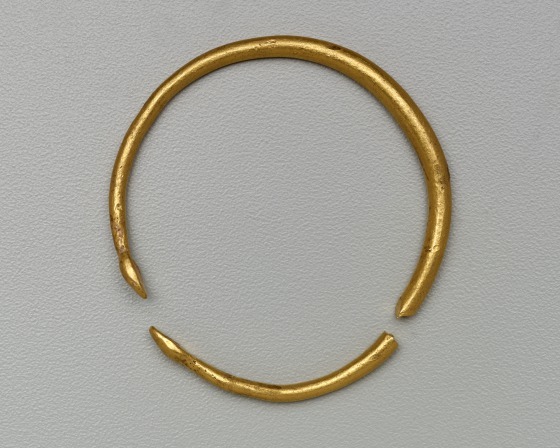 This bracelet and other gold pieces (1991.75.92.1, 1991.75.92.2.1, 1991.75.92.3) were found buried together. This small, unfinished snake bracelet was found cut into two, possibly rejected because of its strange proportions. The hoop was likely severed into two parts by a sharp blow, in all probability with the intention of reusing the gold. Snake bracelets like this were not only personal ornaments, but also amulets. Probably for this reason they are one of the few naturalistic motifs that continued to be popular long after the decline of the Greek world. 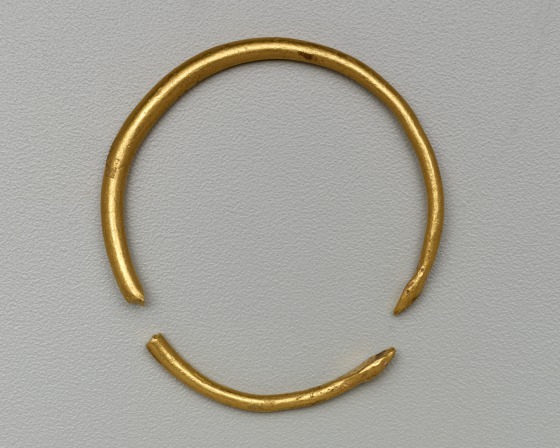 Barbara Deppert-Lippitz, Ancient Gold Jewelry at the Dallas Museum of Art (Dallas: Dallas Museum of Art in association with the University of Washington Press, 1996), 108; 144. In ancient Greece, bracelets were always and only worn in pairs.